Overview: Newsboy Billy Batson is led down an abandoned subway tunnel, where he encounters the ancient Egyptian wizard known as Shazam. Shazam is looking for a new successor to protect the earth, and has chosen Billy Batson for this role. When Billy speaks the name “Shazam”, a bolt of lightning strikes down and he is transformed into Captain Marvel, the world’s mightiest mortal. As our story begins, Captain Marvel, as well as his friends, family, and even foes, have been caught in a time bubble for twenty years. Returning to Earth in 1973, they all quickly integrate themselves into the new world, albeit in slightly different roles. For example, we see teenage Billy Batson give up hawking newspapers on the street corner to become a TV news anchor. All of the familiar faces from the Fawcett Comics run make a return in this volume. The full Marvel Family re-assembles: Mary Marvel, Captain Marvel Jr, Uncle Marvel and even Mr. Tawky Tawny. Captain Marvel’s rogues gallery, which rivals that of Batman or the Flash, returns in full wickedness: Dr. Sivana, Black Adam, Mr. Mind, and the dreaded Monster Society of Evil! Towards the end of the book, the storyline changes to match the events of the Saturday morning TV show and to bring the characters more into the DC Universe proper. Dudley H. Dudley gives up his Uncle Marvel identity to drive Billy Batson across the U.S.A. in a motor home, so that Billy can file news stories from around the country, and Captain Marvel can be in new locations to stop evil. Superman v. Captain Marvel: Captain Marvel was originally created in the early 1940s by Fawcett Comics, and quickly became one of the most popular characters on the newsstands. National Periodicals (DC Comics) felt that there were too many similarities between their character Superman and Fawcett’s character, so the two companies went to court to decide the matter. This was a prolonged fight across many courts, but the final ruling in the early 1950s was that Fawcett was violating the copyrights of the printed material. A final settlement was made out of court, and Fawcett agreed to pay National $400,000 and would cease publication of the Captain Marvel comics. (At this time, in the early 1950s, super-hero comics were in a sales decline, so it made financial sense to agree to that decision.) These characters would not be seen or used for two decades. In a strange turn of events, in the early 1970s, DC Comics licensed the rights for Captain Marvel and friends from Fawcett Comics to produce these comics collected in this Showcase. Finally, DC Comics bought the rights to all of the Marvel family of characters outright from Fawcett in 1980. Captain Marvel v. Captain Marvel: So while the Fawcett Captain Marvel was in settlement hibernation, Marvel Comics took off in the early 1960s. As their universe expanded, one of the new characters introduced was the Kree soldier known as Captain Mar-Vell. He quickly got his own title under the banner “Captain Marvel” (See my review for Essential Captain Marvel Vol. 1). Fawcett Comics had led their trademarks slip on their characters, and Marvel Comics was able to get the rights, and have held onto those rights ever since. 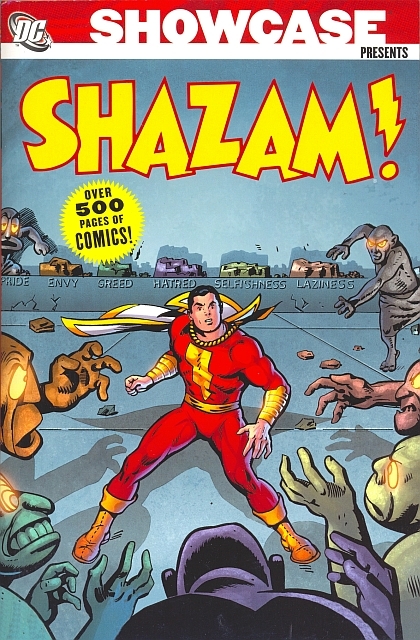 As a result, any Fawcett/DC comic cannot use the title “Captain Marvel” on the comic, which has led DC to begin using the magical word of “SHAZAM” as the title of the books featuring their Captain Marvel. Why should these stories be Showcased? : Well, I really want to give this book two thumbs up and advise anyone and everyone to get a copy, but I can’t. These are so-so stories, done in a way to mimic the Captain Marvel stories of the 1940s. If that is what you like, then go track down the DC Archive editions that reprint those 1940s books. Footnotes: Issues #8, and #21 to #24 contained reprint material from older stories. The only new material in those issues were the covers, which are included in this Showcase volume. This collection ends with issue #33, but the series ran for two more issues. Beginning with #34, the stories took a more realistic approach to the stories, to integrate it more into the DC Universe proper. The art went away from the animated style of C.C. Beck. After this title ended, the Captain Marvel storyline continued as a feature in World’s Finest Comics and in Adventure Comics. If you like this volume, try: Shazam! The Monster Society of Evil from 2007. This is available as both a hardcover and as a trade paperback. Written and drawn by Jeff Smith (BONE), this was a fresh take on the classic storyline. Captain Marvel and Mary Marvel unite to stop the powerful Dr. Sivana and his evil allies from taking over the world. This book is a much better homage to the 1940s work of Otto Binder and C.C. Beck than the 1970s series collected in this Showcase. This entry was posted in DC Showcase Presents, SHAZAM! and tagged Bob Oksner, C.C. Beck, Denny O'Neil, E. Nelson Bridwell, Elliot Maggin, Kurt Schaffenberger, SHAZAM. Bookmark the permalink.